Club Penguin Cheats by Mimo777 Club Penguin Cheats by Mimo777: Club Penguin Newspaper Delay! Oh No! As we told you on Tuesday, we've been working hard to make the game faster for you with new servers. The team's run into a bug and we're not going to be able to deliver the Club Penguin Times when it normally comes out. The team's working really hard to fix the problem. We know a lot of you read the newspaper as soon as it comes out and we want you to know that we really appreciate your patience. Oh no! What will we do without the Club Penguin Newspaper?! Do you look forward to the cp newspaper? How could they make the newspaper better? I think we should be able to have a CPG article every week and you could all help! Thanks, Fluffygood for the tip! i wait every thursday for a new newspaper it always reminds me of the updates. Great Idea MImo we should have a CPG paper each week. I think we also should have ZEBRA PARTIES EACH FRIDAY 5:00 to 7:00 standard eastern time. One way they could make the newspaper alot better is to put a catolog in the newspaper. then you wouldent have to go to the giftshop and what not. MIMO ROCKS AND SO DOES CP, I LOVE YOUR SITE!!!! YAAAAAAAAAAAAAAAAA. well some people (like me) miiiight not be able to attend those kinds of parties if we live on the west coast. But still, thats a REALLY cool idea and i like it alot! Me too! I love reading it! Aw. 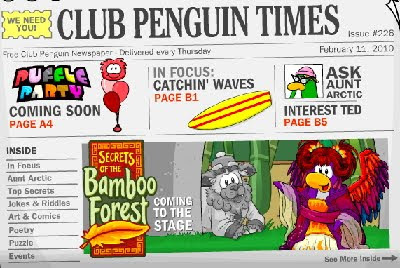 I was really hoping that Club Penguin would update their newspaper! P.S: I know I've had a lot of websites before, but the one I have now is my final one/only one! i love catching up on the updates and the hints and tricks! Mimo is very busy and he will have alot of parties this year too. But thats a good idea! Lets see If he accepts. To be honest, I don't really like the newspaper. And I think that they should bring back that thing on the newpaper saying 'new!' if you hadn't read it yet. what has the nespaper got in it? i vote that mimo is way better than the newspaper! How about the CPG times ever satday. yea! good idea we should have CPG newspaper and the name should be "The Club Penguin Gangers"
A CPG News would be great! You could review the mods list more often and publish it in the paper! yayyyy im back and (maybe) modding!! like pilpup i couldnt go modd because of school and fluffygood thats a good idea! oh ya iv got a new signiture!! I LOVE the newspaper!It always make me happy! hey mimo! I think we should have a secret area in think C.P.Times that can make you a member or an EPF agent or a fire ninja or a CPG mod!!! oh ya GO MIMO!!!!! i like looking at the cp newspaper but comeing to your site for the latest update is way more cool, fun and just awsome!! I dont need the newspaper. I LIVE the newspaper. I wake up extra early every thursday to read it. So when I typed this it was 6 o clock! I think that might be a bit much. Mimo probabably doesn't want it to be that easy. I know that I look forward to the paper every thursday and this is really upsetting. Noo! i love to read the newspapers every week. Yes Mimo, we must organize a CPG paper every week. I think it stinks! :( i look forward to reading the newspaper because i like the funny names that are in aunt artics column. GO MIMO!!! Hey, for everything they do for us, its fine by me if its delayed. I mean they do everything for us, so im letting them do what they need to do. i like the news paper cause it tells me when to get clothes and furniture!! i see the newspaper once it comes out and yeah we can have a newspaper for CPG and the mods can help be editors!!! Oh No got to gget the Newspaper its TUESDAY! Me too!But sometimes it comes with exiting news! I know!Its a very cool idea! I like the newspaper! I like seeing what's new in the Events section. Hope things get sorted out! I'm all for the CPG newspaper, but I don't really care one way or the other on the Club Penguin newspaper. Oh yeh make a CPG newspaper!! Also it's a big deal... We need to it know stuff, like April fools coming up. Yea mimo the clubpenguin newspaper is awesome I wonder what would happen without it. I sure hope clubpenguin fixes this problem. Noooo! not that newspaper! there might be clues in there! Don't worry club penguin will definately fix the problem. But then there would be no point of having a gift shop. And you just made my ears fall off! Hmmm.. No wonder I opened it to find last weeks! Oh well! Hope it comes out after school! I'm going ice skating for Valentines Day today! Waddle on ClubPenguinGang! Mimo, I was reading the newspaper today(The non-updated one) and I was reading the little paragraph on the new play, and it said "But be ready because this quest will take you well beyond the stage" Then I realized that the mine is right under the stage, so I think the room in the mine will be part of the bamboo forest! I know some of the puffle items! A drier and a thing where ur puffle goes in and rolls around! Hey Mimmo how did you get that pic of the new newspaper?? Newspaper delayed? That's too bad..
Teh news makes everyone happy! yay! :) (snap out of it, toooooooo slap happy.) lol, jk. Hmmmmmmmmm mayeb your right! I never thought of that! That might be why they closed down the mine! Good thinking! Mimo I think this could delay the play and puffle furniture catalog :-( Oh No!! At least they told us in advance. Yeah, that was minor, but I miss it. Good spot safa! Thats true! Yeah! Corse Mimo will keep us filled in on any info we need to know! i love the newpaper and look forward to it!! i also really want to know about the puffle party and the new play! Yeah.. that is a good idea.. and being a Mod.. that is even better! I have always wanted to do something like this! My 15 minutes of fame are here!! ***Passes Out***** "TOYS! Wake Up! You have been fired from the CPG Newspaper!!" Nooooo!!! Good Idea.. but actually, the mine is not under the Stage... the pool is... the new cave rooms went outward and under Aqua Grabber. Good Observation though... the play will probably reveal a new room! Please do not put (CPG MOD) after your name when you are not modding. See the Mod Rules for more details! Thanks! Yeah.. last night.. the servers that like Blizzard took forever to load! We had to go on a server that was empty!! Yeah.. I read the events too! I really like to see what is up!